'Childsong' RB- ( Elm Jensen, R. 1983). Seedling 40/GA-2. AB, height 19" (48 cm), Midseason bloom . 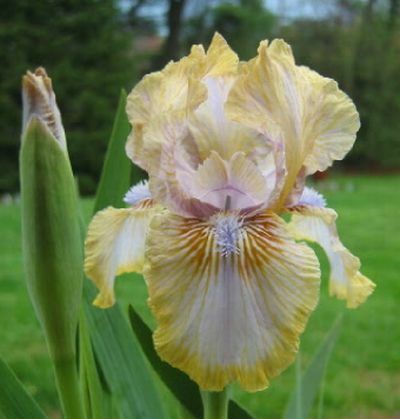 Standards light gold, veined lavender, narrow metallic lavender flush up outside of midrib; pale lavender crests; Falls light gold with metallic lavender flush, edged dark gold; heavy butterscotch veining surrounding beard in a ray pattern, giving effect of a signal; pale lavender beard turning red in throat; pronounced sweet fragrance. 'Forty Winks' X 'Genetic Artist'. Aril Society, 1984. JPG childsong01.JPG manage 451 K 05 May 2018 - 03:09 Main.TLaurin Photo by Nancy McDonald-The Pickle Barrel Collection.